A disadvantage of wet etching is the undercutting caused by the isotropy–lateral etching at the same rate as the vertical etch. The purpose of dry etching is to create an anisotropic etch – meaning that the etch is directional. An anisotropic etch is critical for good pattern transfer. RIE etching is a standard method of dry etching. 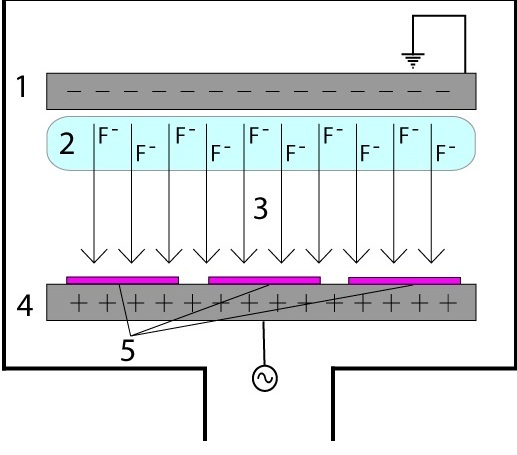 The Fluorine ions are accelerated in the electric field, causing them to collide into the surface of the sample. A mask is used to protect certain areas from etching, exposing only the areas desired to be etched. 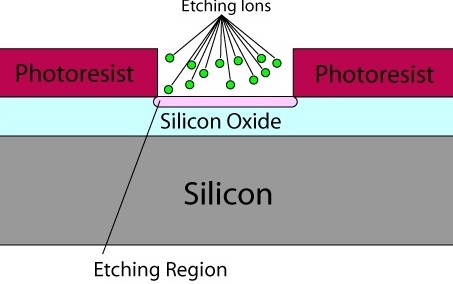 The figure below shows a photoresist mask on silicon dioxide. 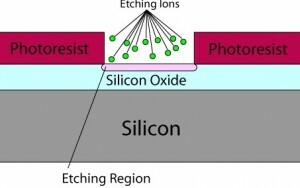 The etching ions are accelerated into the etching region, where they combine with silicon dioxide and then are dispersed. 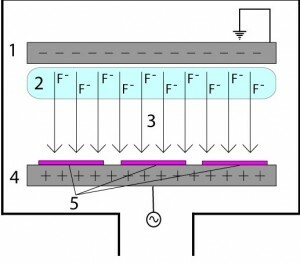 Because the electric field accelerates ions toward the surface, the etching caused by these ions is much more dominant than the etching from radicals – ions traveling in varied directions, so the etching is anisotropic.